Kris Baker of SabresProspects.com has submitted his annual rankings of the top 30 draft-eligible prospects. Check back each day as we prepare for the 2015 NHL Draft at BB&T Center in Sunrise, Florida on June 26-27. A highly intelligent offensive force, Marner is quick on his feet with a slick handle on the puck and an ability to quickly change directions. The elusive quality sees him fend off defenders and regularly find space to make a precise dish to an open linemate or pick a corner for a goal. Qualities reminiscent of Claude Giroux are in play, making Marner one of the more sought after scorers available once the top two picks fall off the board. The top-line winger was a dynamic force for London in his draft season, tallying 126 total points to finish second to fellow draft-eligible forward Dylan Strome of the Erie Otters for the Ontario Hockey League regular-season scoring title. Despite scoring just one goal in his first 11 games and ending the year with just one his final eight, Marner cashed 42 in the 44 games in between. He posted 82 helpers including a league-best 53 primaries. If that wasn’t enough, Marner was a postseason machine with seven goals and nine assists in seven games before an upper-body injury ended his run prematurely. 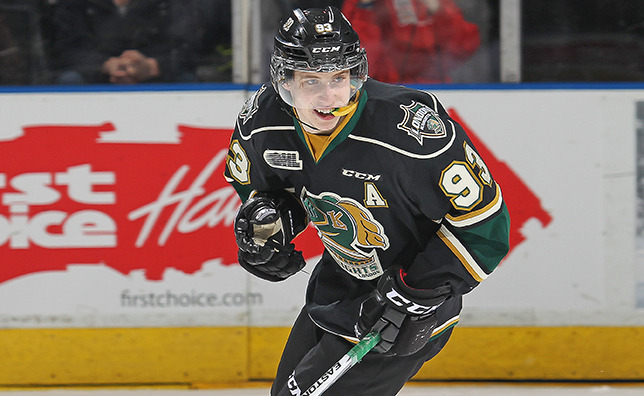 Marner’s smallish frame has been questioned, but skill is skill and the Knights product has it in high supply. Adding the necessary strength that 18-year-olds usual need to develop will be paramount to his NHL success. But for now, Marner – who earned nods in the Smartest Player (1st), Best Playmaker (2nd) and Best Stickhandler (3rd) categories in the OHL’s Western Conference Coaches Poll – has the firm foundation in place to be a game-breaking difference maker down the road. For more on all the youngsters in the Sabres pipeline, check out Kris Baker’s website, SabresProspects.com. You can also follow him on Twitter (@SabresProspects) for in-game updates throughout the week on any Buffalo prospects that are in action.